Welcome to Something About Coins! 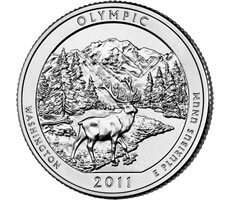 A new quarter-dollar from the U.S. Mint, the Olympic Park Quarter, entered circulation Monday, and 2011's coin production was on the rise. One of the world's largest collections of pre-Hispanic and colonial-era coins is reportedly at a new museum in Mexico City. San Francisco Mint news included its 1856 dated eagles. A piece of advice when selling coins is do your math, because 1200% more than face value may not be more than the coin's melt value. Enjoy!